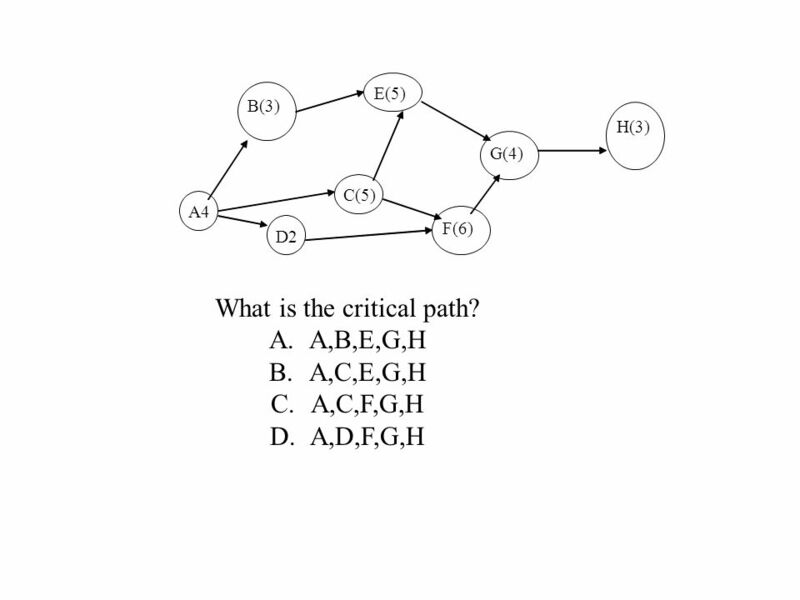 3 What is the critical path? 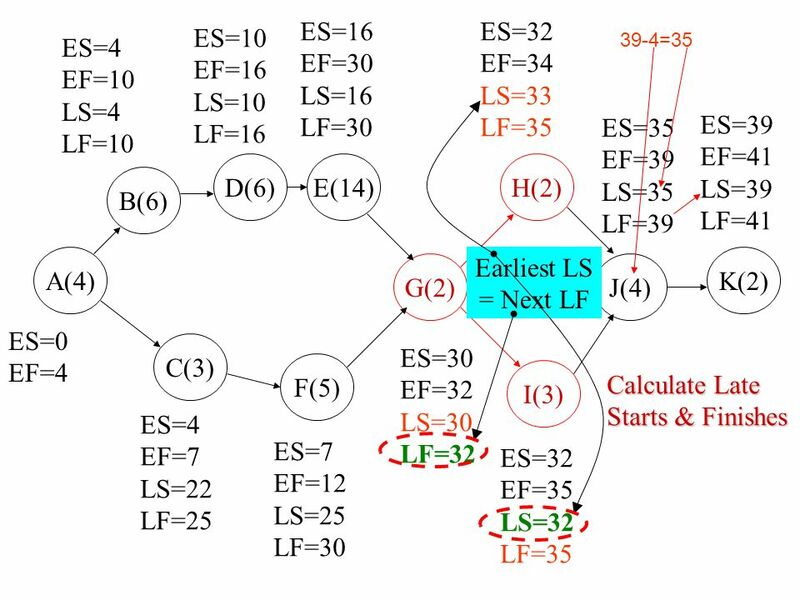 Download ppt "ES=32 EF=34 LS=33 LF=35 ES=10 EF=16 LS=10 LF=16 ES=4+6=10 EF=10 LS=4"
PROJECT MANAGEMENT Chu Eu Ho Dept. of Civil and Environmental Engineering Massachusetts Institute of Technology. © The McGraw-Hill Companies, Software Project Management 4th Edition Activity planning Chapter 6. 2/21 Project Management Roll call/ collect homework Go over homework(?) Project management: Critical Path Method Small groups Assign homework Discuss midterm. Richard Fisher 1 The University of Texas at Dallas Project Management BA 4320 Richard Fisher The University of Texas at Dallas. Start D finish A B C E I G H F J KL N M ActivityDescription AExcavate BFoundation CRough wall DRoof EExterior plumbing FInterior. 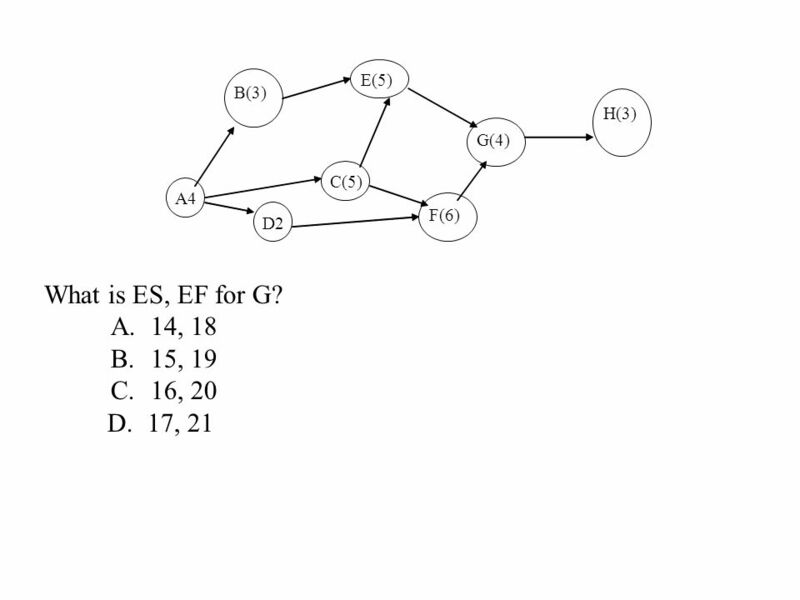 PRJ566 Project Planning and Management Lecture: Network Diagrams. 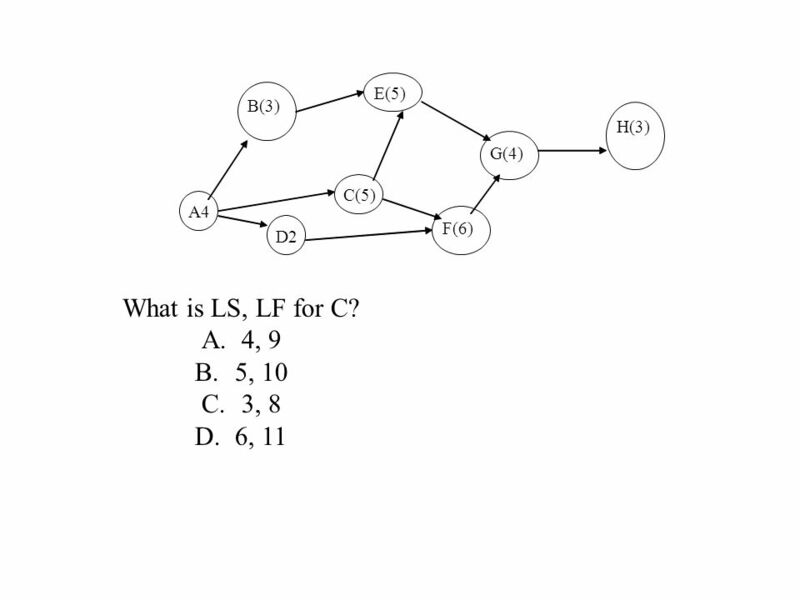 PRJ566 Project Planning and Management Lecture: Dependencies and Network Diagrams. 1 1 Slide © 2006 Thomson South-Western. All Rights Reserved. Slides prepared by JOHN LOUCKS St. Edwards University. Calculate the critical path Arrow diagram Critical Path Method Edina Nagy Lajos Kiss Szabolcs Hornyák. Prosjektstyring A 5 WEEKS B 10 WEEKS C 12 WEEKS D 8 WEEKS E 6 WEEKS ACTIVITY (t) ESEF FL LS LF We have a network with. 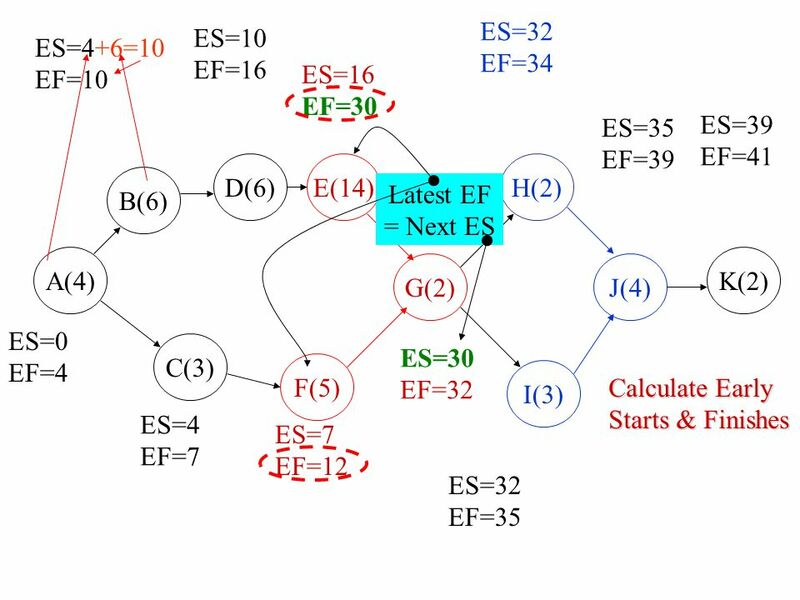 Calculating Float ActivityPrecedenceDuration Start0 D 4 A 6 FD, A7 ED8 GF, E5 BF5 HG7 CH8 EndC, B0 1. What is the duration of the critical. F O U R T H E D I T I O N Project Management © The McGraw-Hill Companies, Inc., 2003 supplement 3 DAVIS AQUILANO CHASE PowerPoint Presentation by Charlie. 1 Lecture by Junaid Arshad Department of Engineering Management Abridged and adapted by A. M. Al-Araki, sept WBS: Lowest level OBS: Lowest level. 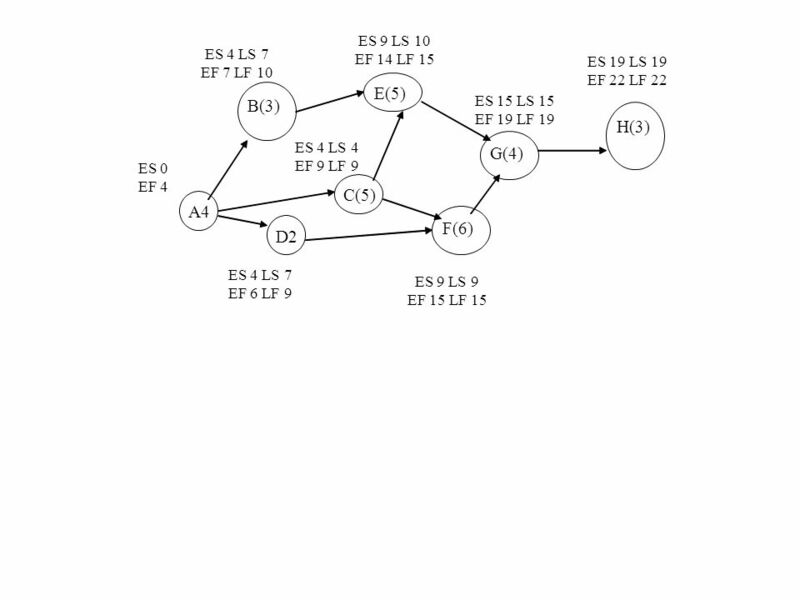 Network Diagramming Network Analysis  The common term for network analysis is PERT  PERT stands for Program Evaluation and Review Technique  The word. Project Management Project  A series of related jobs usually directed toward some major output and requiring a significant time to perform Project management. CSSE Sep.2008 Constructing and Analyzing the Project Network Diagram Chapter 6. Gantt Chart Graph or bar chart with a bar for each project activity that shows passage of time Provides visual display of project schedule Slack amount.